Home / Editor's Choice, Entertainment News, Forum and discussion, Gossip and Drama, Photos / Hot Zimbabwean female cops leave thirsty men panting(PHOTOs). Hot Zimbabwean female cops leave thirsty men panting(PHOTOs). 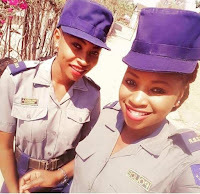 Thursday, April 4, 2019-These hot Zimbabwean cops have stunned men with their beauty. They have pretty faces that can give some of the models a run for their money. They smiled for the cameras while taking a selfie and the charming smiles are driving men crazy.